The backup satellites ensure the continuous stable operations of the system, said Ran Chengqi of BeiDou Navigation Satellite System, at the Ninth China Satellite Navigation Conference in Harbin, capital of northeast China’s Heilongjiang Province. BeiDou-2 has been in use for more than five years and is generally stable and has never been out of service, according to reports published by the Xinhua news agency. The positioning accuracy of the system has improved from 10 to six meters. BeiDou-2 uses 14 navigation satellites, offering positioning, timing and SMS to customers in the Asia-Pacific region. The BeiDou-2 system is scheduled to provide navigation services through November 2018, and by October of 2020 the service will be performed by both BeiDou-2 and BeiDou-3. The first two BeiDou-3 satellites were launched in November 2017, with two additional satellites sent into space in February of this year. In other news from the China Satellite Navigation Conference (May 23-25), it was stated that the country is planning to finish building a high precision national comprehensive PNT system on the basis of the BeiDou system by 2035. With the completion of the system, China will improve its ability in space and time information service, said Chengqi. Named after the Chinese term for the Big Dipper constellation, the BeiDou project was formally initiated in 1994. It began to serve China in 2000 and the Asia-Pacific region at the end of 2012. 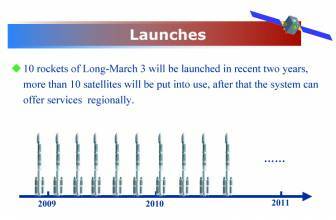 By around 2020, the system will have more than 30 satellites. It has been widely used in public security, transportation, fishing, power supplies, forestry and disaster relief in China. According to the Xinhua news agency, 33,500 taxis and 21,000 buses in Beijing, and 40,000 fishing boats off the country’s coast are equipped with terminals of the BeiDou system.